While Amazon CEO Jeff Bezos was wavering between being the richest person in the world and the second-richest person in the world, his company stealthily revealed its plans to secure precious real estate inside apartment buildings. 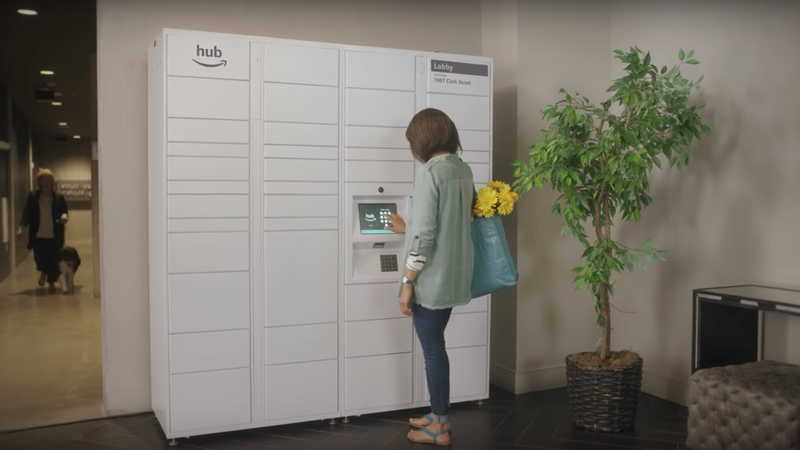 Amazon is now offering a new service called Hub, consisting of modular lockers that the company aims to install in multi-tenant dwellings so people can pick up packages at their own convenience. It’s a closer-to-home version of the Amazon Lockers that have been installed at stores and public spaces across the world. As with Lockers, Hub compartments pop open when package recipients enter a pickup code. But Hubs are slightly sleeker than Amazon’s excessively branded Lockers, and they accept packages from all senders and retailers—not just Amazon. Amazon is pitching outdoor and indoor version of Hubs in four different neutral colors and various sizes, starting with a 6-foot wide locker with 42 compartments. An expander segment adds 23 compartments. Most people have experienced the agony of missing a delivery—because they weren’t home, or because a shipping mistake, or some other mysterious reason. And many people have also experienced the dread that comes with knowing an expensive item may have been left outside their building, or right inside the entrance, tempting potential thieves. As we increasingly do more shopping online, these Hubs could take some of the friction out of delivery. Of course, this is also a major power move. Amazon was already elbowing its way into homes with Echo. Now it’s trying to invade our mail rooms. Hubs will allow Amazon to involve themselves more intimately with the delivery process, a part of their service that they currently have little control over. With Amazon’s development of the Prime Air drone delivery system and its acquisition of French delivery company Colis Privéto, the online store has been laying the groundwork to take on DHL, FedEx, and UPS. Hub is just the latest move in their plan to retool the entire delivery infrastructure in a way that benefits Amazon.